An artist's impression of how XA271 would have looked on the day of the accident. The aircraft was painted silver overall, with RAF roundels and yellow 'trainer' bands around the wings (between engines 1 and 2 and engines 3 and 4) and on the tail section. The aircraft individual code letter 'A' was painted on the tail section and repeated on both sides of the nose. The serial number 'XA271' was painted beneath each wing, reading from the aft on the port-side wing and from the front on the starboard. Early on the morning of Thursday 30th September 1954, Flight Lieutenant Arthur Gavan at No.2 ANS, RAF Thorney Island gave a briefing for a navigational training sortie to take place later that morning. Gavan was the Duty Flight Commander on Varsity Squadron, and he duly authorised Sergeant HPS Fowler to fly Marathon s/n XA271/A on a cross-country exercise routing from Thorney Island to Cosham and then via Bude – Trowbridge – Northampton – Spalding – Dungeness – Petersfield and back to base. The exercise was to proceed at the nearest quadrantal heights to 6/7,000 feet. The Bude leg was completed without incident, but at 5,000 feet, rather than the briefed 7,000 feet. The aircraft then turned onto the Trowbridge leg at the same altitude and at 11.30am XA271 was recorded 30 miles southwest of Trowbridge. At this time, Sgt Fowler passed a QDM (magnetic heading to station) of 125 degrees to Thorney Island tower, and this was returned to the aircraft as 296 degrees true. Fowler had meantime changed course towards Northampton. A position line obtained at 11.40am by P Off Green showed the aircraft’s position to be two miles south of Trowbridge. At 11.45am that morning, about two hours after taking off from Thorney Island the aircraft was heard making an unusual noise in cloud. Immediately after this it was seen in a left-turning dive at about 300 feet, with both outer wings missing (the outer wings were estimated to have broken off at about 1,000 feet). The Marathon pulled out of the dive at a very low height and went into a steep climb, by which time it was heading in a south-westerly direction. At the top of this climb it levelled out for a short period and then dropped onto its starboard side, turned right and dived into the ground. The aircraft was apparently in and out of low cloud during the latter part of its flight following detachment of the outer wings. It struck the ground in a steep nose-down attitude and all five occupants were killed. It was later reported in the local press that a partially-opened parachute had been seen attached to one of the bodies, indicating that at least one person might have tried to make an escape. There is no evidence of this in the official records. 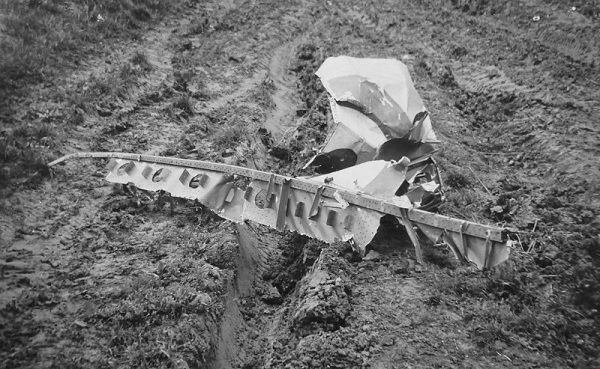 The outer wings of XA271 fell either side of the aircraft’s north-bound track on the village of Calstone Wellington in Wiltshire. The debris field measured approximately 597 yards x 337 yards. 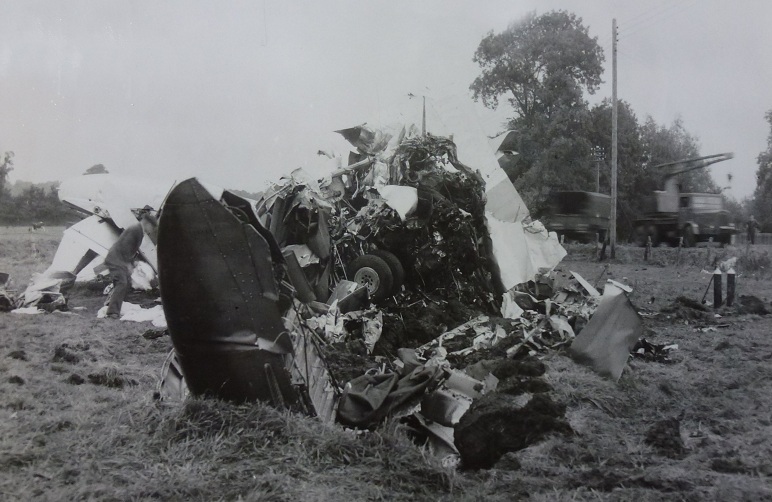 The main fuselage of the aircraft fell to earth about 1½ miles further west, in a field at Rough Leaze Farm on Stockley Lane, about 1½ miles south-southeast of the town of Calne. Even before the aircraft had crashed, Mr Smith at Pillar Lodge on the Bowood estate had reported an aircraft in difficulties. Therefore they were already alerted when another call came in from Mrs Atwell at Rough Leaze farm to say that the aircraft had impacted the field nearby. The police, along with fire appliances from both Devizes and Calne were soon on the scene. But a fire reported in the aircraft had been extinguished when the aircraft hit the damp earth. Meanwhile, an aircraft crash had been reported 1.3 miles further to the southwest, at Broads Green.and with no fire to attend to, the fire fighters were dispatched there. For a while it appeared that a second aircraft could have been involved. It proved to be a false alarm. Weather at the time had the cloud base at 650 feet ASL, with poor visibility and slight drizzle. Wind measured at RAF Lyneham was 17 kt at 220 degrees. Map of the crash scene. 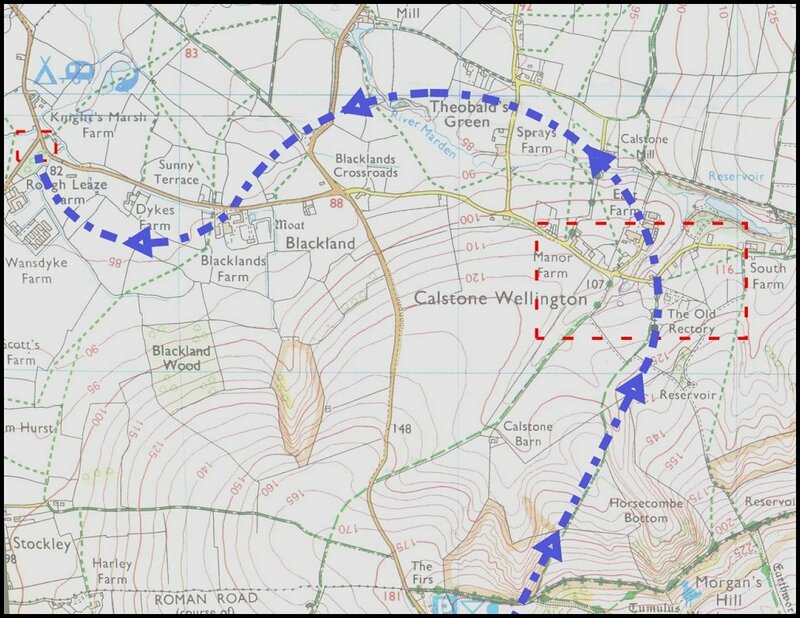 The wings broke off and fell on the village of Calstone Wellington in the area at right bounded by the red dotted rectangle. The main fuselage flew on and impacted further to the west (red-dotted square). There were a number of eyewitnesses to the accident and their statements were later recorded by the RAF Court of Enquiry team. The first witness was Mr Robert Comley of 2 Robins Place in Calstone. He was a farm worker at Manor Farm in Calstone, close to the place where the outer wings came to earth, but at the time of the accident was working further to the west at Wellington Barn. He stated that, “At 11.45 hours I heard an aircraft in the vicinity. On looking up I saw it flying in and out of cloud in a northerly direction. It appeared to be flying level. As I watched, pieces began to fall off it. I did not hear any explosion or unusual noise. 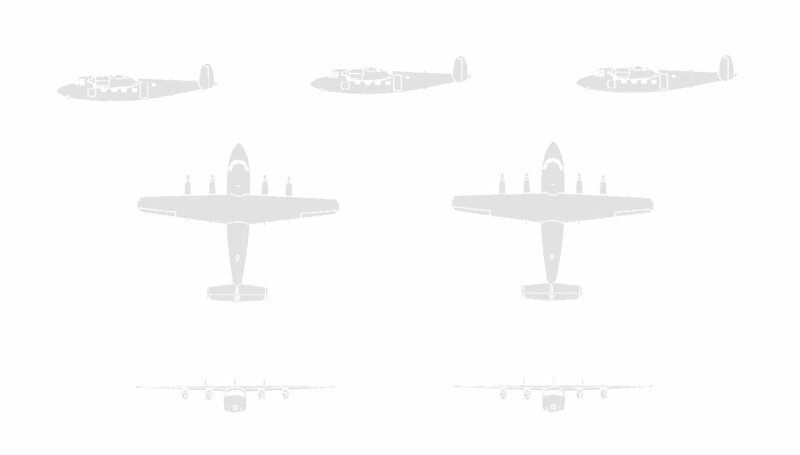 The aircraft turned towards the west, flying away from me, and black smoke came from the engines on the left side. The aircraft appeared to turn on its side and dropped down out of my sight”. The outer wings fell on the village of Calstone Wellington and this satellite view encompasses the same area shown on the map above. The letters denote the location of specific pieces of wreckage as follows: A-two stiffeners, B-four stiffeners, small piece of perspex, navigation light moulding, C-piece of starboard mainplane top surface with antenna, piece of mainplane top surface, piece of starboard mainplane lower surface from just outboard of outer engine, D-piece of mainplane surface with nine feet of main spar, length of aileron control rod, E-eighteen feet of Rebecca aerial lead, F-leading edge joint, G-starboard wingtip with nine mainplane ribs, H-port leading edge, J-port wingtip with nine mainplane ribs, K-starboard aileron with tab, port aileron control group, nine feet of port main spar with some structure, L-starboard outer mainplane leading edge, inboard end, M-piece of outer mainplane trailing edge with one aileron hinge, N-piece of starboard outer mainplane trailing edge with aileron shroud, O-starboard outer mainplane leading edge, P-port aileron complete with tab, R-mainplane leading edge skin, S-mainplane skin painted with portion of roundel, and stiffeners. Two items found at the Calstone Wellington site. At left (location 'K' on the map) is the port aileron control group marked '19NAV PORT' and at right (location M) part of an outer mainplane trailing edge. The latter was not fully identified in the accident report, but from the orientation of the serial number, it must be from the port side. Some idea of the violence of the crash came from a statement made by Mrs M Clifford, who lived in the cottage just across the road. She said, “I was indoors when I heard a terrific explosion just outside, then mud spattered all over my windows. I ran out and saw the crashed aeroplane in the field in front of the house. Fortunately my children were indoors, as it was raining”. The variations in the aircraft heading noted by some of the witnesses showed that the aircraft followed an s-shaped flight path after the separation of its outer wings. The Senior Medical Officer (SMO) at nearby RAF Lyneham, Sqn Ldr Ian M Ogilvie was alerted of the accident at 11.57 am and immediately he put a team together and headed to the scene. On arrival he inspected the wreckage and located the bodies of the five-man crew. Two bodies were in the open in the immediate vicinity of the cockpit (Sgt Fowler and P Off Green), two more were found in the centre of the wreckage (Fg Off Dench and P Off Persad) and the fifth (Sgt Davies) a short distance away, beneath the tail section. The first two bodies were removed under direction of the SMO but not identified at the time. The remaining bodies were removed under the direction of the Unit Medical Officer, Flt Lt Deeman and all five were transferred to Station Sick Quarters at Lyneham, where full identification was carried out. The medical staff determined that death for all had been instantaneous, the result of severe head and other multiple injuries. There was no positive evidence that any of the crew had been strapped in. 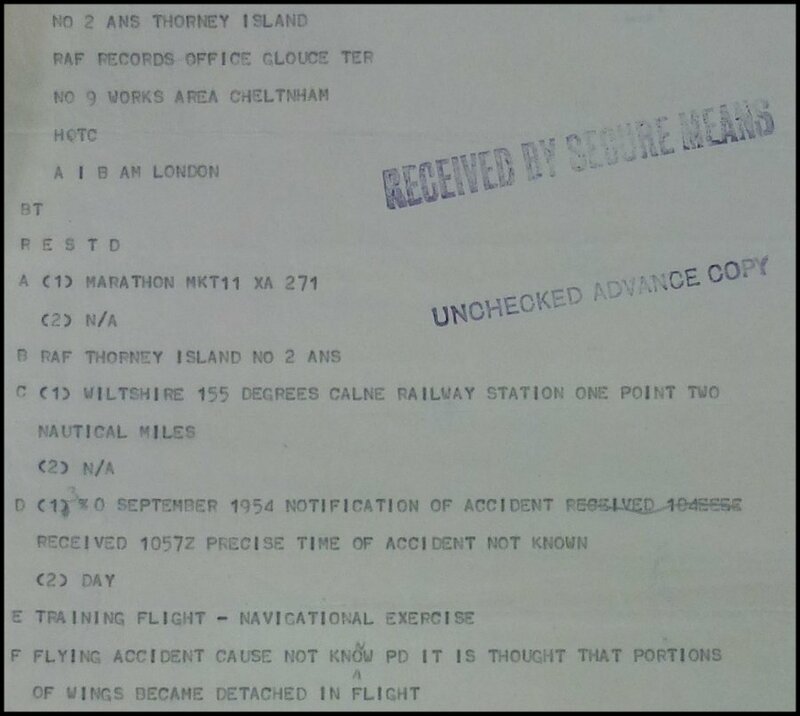 Later, at 5.10pm on the day of the accident, staff at RAF Lyneham sent a signal to involved parties (Air Ministry, HQ Training Command, HQ Flying Training Command, HQ No.21 Gp, HQ No.43 Gp, 49 MU, No.9 Works Area Cheltenham, Accidents Investigation Branch and No.2 ANS) detailing the circumstances of the accident. 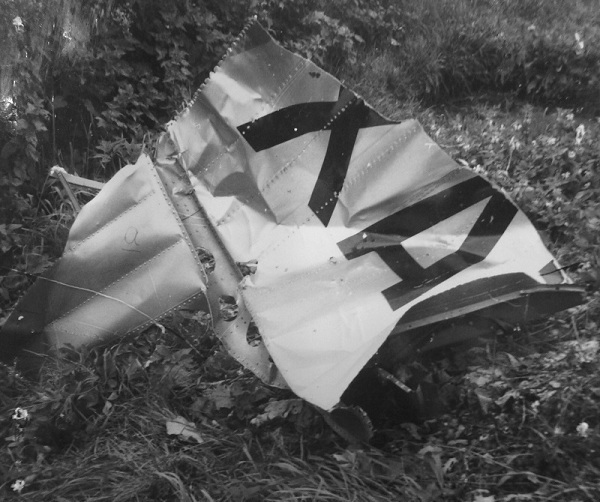 Part of the Lyneham signal of 30th September, showing that the aircraft had crashed east of Calne. The basic circumstances were already known. 4. Evidence to be taken on oath. Meanwhile, the AIB detailed the Inspector of Accidents, Mr Bertram A Morris to proceed to the scene of the accident and to assist in the Enquiry. On the morning of 1st October the Court members began by inspecting a Marathon aircraft at Thorney Island then at 11.45 they boarded an aircraft (presumably not a Marathon!) bound for Lyneham. Unfortunately the allocated aircraft was then found to be unserviceable and following lunch they finally departed in the afternoon, arriving at 3.30pm. The Court immediately travelled to the accident site before returning to Lyneham in darkness at 8pm. The following day they returned to the crash location and interviewed eye witnesses. This process carried on throughout the weekend, the Court finally leaving Lyneham for discussions with Handling Squadron at Boscombe Down at 10.15am on Tuesday 5th October. They returned to Thorney Island later that day and then interviewed further witnesses on base during the following day. The proceedings of the Court of Enquiry were passed to the Station Adjutant at RAF Thorney Island at 11.15am on Thursday 7th October 1954. 1. Both outer wings of the aircraft had broken in flight and became detached. The two wing tips broke off, each at a position nine ribs in (Rib 318), under an upload; it is probable that the primary failure occurred at this point. Breakup of the remainder of the wings from the outboard engine nacelles followed immediately. The outer wings appeared to have been subjected to fairly severe stress under positive “G” load. The major parts of the outer wings fell in a small area 350 yards by 600 yards. The remainder of the aircraft crashed one and a half miles away, hitting the ground in a very steep dive with the starboard wing down. There was no trail of wreckage or sign of fire. (The AIB inspector stated that since the failures were symmetrical on both sides of the aircraft and that the portions of wing fell close together, they were probably the primary failures). This schematic of the Marathon's outer wing shows Rib 318 ('318.0' on the illustration), where primary failure of each panel occurred. 2. The engines were buried six feet down in heavy clay. They are being dug out and removed for strip examination by the AIB. It was not considered that any positive indication would be gained from the condition of the propellers which would indicate whether the engines were under power at the moment of impact; this also is to be examined by the AIB. 3. It was not possible to establish positively the rudder and elevator trim tab settings but measurements of the actuator extensions were taken. 4. The five crew members were located in their normal positions. The state of the pilot’s harness indicated that he was not strapped in his seat. 5. The VHF frequency selected was 106.02 m/cs, that of the Flight Information Service. 6. Although the gyroscopes of the artificial horizon and of the turn and slip indicator were rotating at the time of impact. It was not possible to state positively that these instruments were working correctly. Further examination is being made by the AIB. 7. 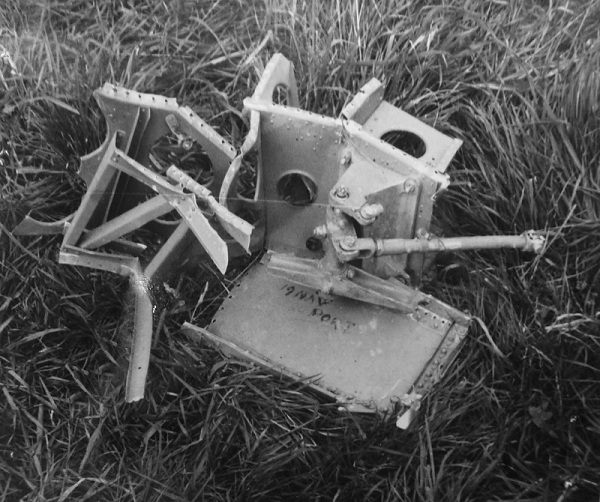 The crash damage to the pilot’s cockpit was so great that no positive indication could be gained from any of the instruments or controls. At the time of the accident, the estimated all-up-weight was about 17,137 lb (maximum is 18,250) and the C of G position was about 34.59 inches aft of the datum (maximum aft limit is 40.1 AOD). The AIB inspector, Mr Morris added that further and more detailed examination would be done at Croydon and following this, material tests would be carried out to ascertain their compliance with requirements. The AIB would also analyse the control trim settings (derived from measurement of the actuators) in conjunction with Handley Page. These items would be covered by a separate AIB report. 1. The accident was caused by a structural failure of the outer wings. From the sound of the break-up, heard by witnesses as one explosion, and the small area covered by the pieces of wing, the Court considers that both wings failed simultaneously as a result of over-stressing due to the application of positive “G”. 3. The pilot obtained a bearing from Thorney Island at 1040Z (11.40 am local), five minutes before the aircraft was seen to break up. The Navigator had done 2 minutes work on his chart since 1040Z. 4. No emergency calls were received from the aircraft, nor was the VHF on an emergency frequency. 5. The height at which the wings broke up was about 1,000 feet. The aircraft could have been visible in the broken cloud to the 5th witness (Mr Comley) at that height, and the time taken for the noise of the explosion to reach the 7th witness (AC/2 Morgan), who was about a mile away [but actually more like 1½ miles], some 5 to 6 seconds, would also indicate that it broke up at this height. 6. Comparatively light stick forces at speed can lead to over-stressing the aircraft. This fact is contained in the Pilot’s Order Book at Thorney Island. 7. The crash occurred on the southern edge of Airway Green 1. The pilot had not cleared through this airway. 8. The cloud conditions at and around 5,000 feet were changeable. It appears from the evidence that in the Calne/Lyneham area both before and after the time Sgt Fowler was approaching, an aircraft would have been in the clear, but perhaps not VFR 500 feet above the cloud tops. 9. The measurements of the rudder and elevator trim tab actuators taken at the scene of the crash were set up on another Marathon aircraft and this showed that the rudder trim setting was neutral and the elevator trim setting normal. 10. The pilot was very conscientious and had no medical history of disease or injury. 11. The freezing level was at 9,000 feet. 12. Sgt Fowler’s injuries indicated that he was in the pilot’s seat at the time of impact with the ground. 14. The pilot lost control during a sudden descent to get under Airway Green 1, and allowed the airspeed to build up to such a figure that only a light stick force on pulling out was necessary to break off the wings. 15. The pilot performed a violent manoeuvre to avoid another aircraft resulting in a steep dive in cloud. No military or civil aircraft were in Airway Green 1 below 9,000 feet at this time. 16. There was a failure or jamming of the elevator controls. The control wires will be examined by AIB when they get the wreckage to Croydon and can open up the telescoped portion. 17. Instrument failure, causing the pilot to lose control and exceed the limits of the aircraft. 18. One or more engines failed, resulting in subsequent loss of control. It is considered that if the aircraft had been under asymmetric power it would have crashed on its initial dive and it is unlikely that the rudder trim tab would have been neutral. The Court does not consider that the engine smoke reported by two of the witnesses has any significance and was most likely caused by the pilot using his throttles in an endeavour to maintain lateral control. 19. Unaccountable illness of the pilot. This is not borne out by his medical history or by the people who knew his habits. The Court of Enquiry was unable to apportion blame for the accident. 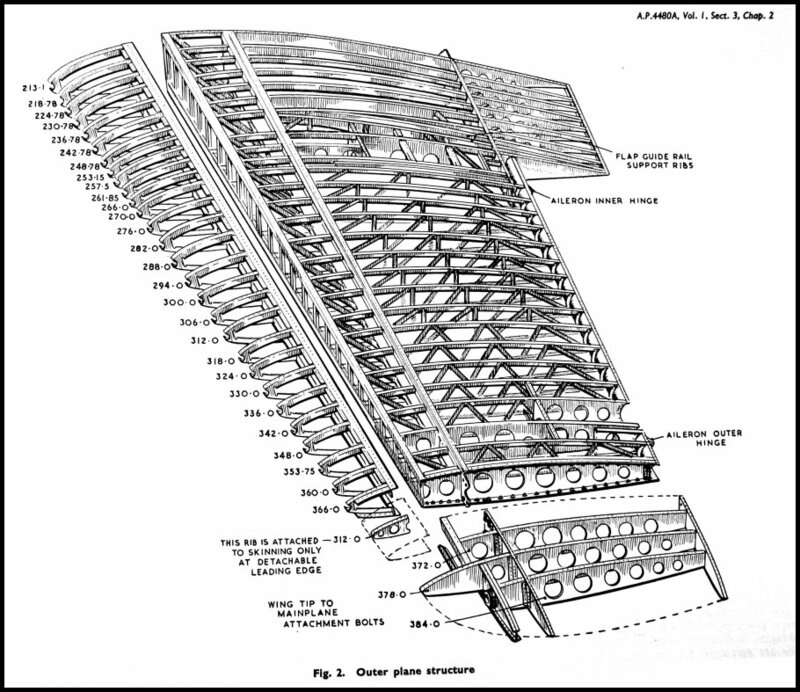 Therefore the Court had just one recommendation: that the elevator trim tab modification be embodied without delay. On 9th November the Wiltshire Coroner, Mr Harold Dole presided over the inquest to ascertain the cause of death. He heard that that the wing-tips of the aircraft had come off in the air before it crashed and Sqn Ldr LAE Osbon explained that there were just eight Marathons in RAF service at that time. He went on to confirm that there was an airframe joint at the point where witnesses had seen the wings separate and that the matter was ‘perturbing’. The Coroner recorded verdicts of accidental death in an aircraft crash, due to the wing-tips coming off through a cause unascertained. The main part of the aircraft dived to earth, compressing the nose section, burying the engines in the soft soil and leaving only the tail section, engine nacelles and some flying control surfaces in recognizeable parts. One of the outboard engine nacelles can be seen in the foreground of this photo. Interim Report AI/S.2720 was issued by the AIB (Civil Aviation) on 8th December 1954. Its object was to, “…draw attention to certain undesirable features of this mark of Marathon which are considered possible contributory factors to this accident.” It was short in nature, reiterating the basic circumstances of the accident and adding more detail regarding the wing failure. 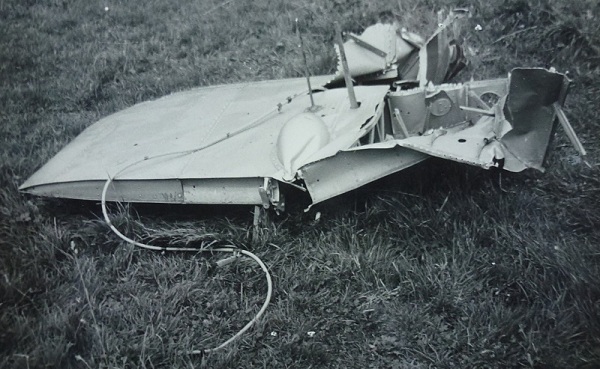 In particular the AIB report was able to confirm that further examination of the wreckage had been done at Croydon and showed primary failure of each wing had been in the inboard lower skin of the outer wing where it attached to the bottom spar boom. The failure was consistent with excessive upward bending of the wings. In addition, the wing leading edge had then lifted at this point, with failure progressing outboard and transferring the up-load of the leading edge outboard until it caused tensile failure of the spar bottom boom in the region of a picketing bracket at rib 318. This damage was consistent with a high-speed pull out. Two more items found at the Calstone Wellington site. At left (location 'D' on the map) is nine feet of main wing spar and at right (location J) is the port wingtip. The bulbous item at centre is the fairing for the aileron mass balance. The 11th Part of Report No. A&AEE 840 Ref A&AEE/571/B2 dated 28th November 1952 states in the Summary para (b): “The values of stick force per ‘g’ during recovery from trimmed dives were lower than required by Air Publication (AP) 970 at speeds above about 160 knots indicated airspeed (IAS). In view of the possibility of structural failure resulting from the application of quite low stick forces, the elevator control should be made heavier at high speed or that the Centre of Gravity range or limiting airspeed be restricted”. Since this was written the C of G range has not been restricted, on the contrary a further extension of the aft C of G limit has been authorized from 37.06 inches to 40.1 inches aft of datum (AOD) for gentle manoeuvres only and not for take-off or landing. It is understood however, that modification action is in hand to move certain electrical and pneumatic equipment forward in order to improve the situation and it is considered that this action should be put into effect without delay. With reference to the A&AEE suggestion that the elevator control should be made heavier for the higher speeds, Marathon modification 1074 (Class B.2) provides for the locking of the starboard elevator servo tab and has the effect of making the elevator control heavier at higher speeds. It is understood that the embodiment brings the stick-force per ‘g’ within requirements at 200 knots (the maximum permissible diving speed is 220 knots). This modification, however, was not embodied [in XA271]. It is suggested that as its embodiment is a comparatively simple matter it should be embodied in all RAF Marathons without delay and that the maximum permitted speed be restricted to 200 knots IAS as recommended in 6th part of A&AEE/840/1 dated 23rd August 1954. The investigation has not yet been finalised and metallurgical examination of specimens has yet to be made, although there is no visual evidence of defective material. Upon completion of this work a final report will be issued. The report also was able to correct earlier reports in that the elevator had been trimmed slightly nose heavy. Full examination of the flying controls had also been completed and showed that they did not reveal any evidence of pre-crash mechanical defect or failure. The flying instruments, though broken, bore evidence of rotation at the moment of impact and there was no evidence of failure in the vacuum system or in the distribution system that supplied the electrical instruments. Strip-down of the engines and propellers also revealed no sign of pre-crash failure. The report was also able to state that the structural specimens had performed correctly. The report’s final verdict on the crash was that, “The accident was caused by structural failure of the outer wings as a result of overstressing the aircraft in the positive ’g’ sense. This occurred during recovery action in cloud, the necessity for which cannot be determined, but may have been associated with loss of' control.” The recommendations were to embody Marathon modification 1074 on all RAF machines, to effect a move of the C of G forwards and to restrict maximum speed to 200 kt. No specific cause for the initial loss of control was ever determined. With construction number 124, XA271 actually began life as a civilian aircraft, having been placed on the civil register as G-AMGT (Certificate of Registration No.3107) by Handley Page (Reading) Ltd on 29th December 1950. It was manufactured as a Mk.1 Marathon at Woodley in October 1951, its Certificate of Airworthiness (No.A.3107) having been issued on 17th August. On 27th October ownership transferred to the Minister of Supply and itwas then briefly stored at Woodley before being transferred for further storage at Lasham on 16th January 1952. It was then earmarked for conversion to Marathon 103 T.Mk.11 and transferred to RAF charge on 28th March 1952, being allotted to No.5 Maintenance Unit the same day, but likely remaining in store at Lasham – the ‘5 MU’ allotment being a means of recording its change of ownership, but not location. It was cancelled from the civil register on 13th June 1952 as ‘Transferred to military’ and concyurrently given the RAF serial number XA271. On or around 27th November 1953 the aircraft returned to the Woodley production line for conversion into a navigation trainer. With conversion complete, the aircraft’s Certificate of Safety for Flight (Form 1090) was signed on 11th May 1954 and the Airworthiness Inspection Directorate released it for RAF service a week later. Unlike most RAF Marathons, which went into storage at No.10 MU, Hullavington, XA271 was instead allotted direct from Woodley to 2 ANS at Thorney Island, the allotment taking place on 26th May 1954 and the actual ferry flight on or around the same date. The aircraft received the code letter 'A', which was painted on the aft fuselage and also in smaller size on each side of the nose section. Its total flying time when it crashed was 351 hours and only normal servicing and maintenance had been carried out. The Gipsy Queen 172 engines were new when installed during the manufacture of the aircraft. No abnormal incidents were reported in the Maintenance Form 700. XA271 was struck off charge in accordance with Signal AFD/43G/961/XA271/EQ on 25th October 1954.